Enjoy this ancient and fascinating horticultural art form. Easy to care for needing only a light trim each autumn to encourage branching. Water well as the compost becomes dry but avoid the tree standing in wet and your tree should thrive and last a lifetime or more! Here's the perfect place to start if you want to cultivate your own Bonsai and enjoy this ancient and fascinating horticultural art form. In it's natural state the Chinese Elm - Ulmus parvifolia often reaches 25m tall yet this specimen - already 7 years old - has been trained by skilful cultivation into perfect miniiature form. 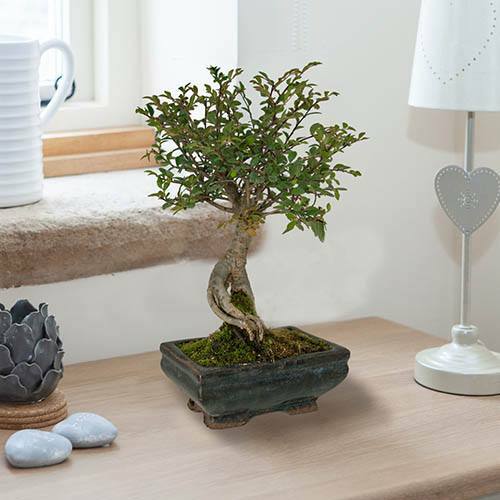 Already fully established in its own decorative ceramic planter this beautiful little tree will provide an instant focal point to any well lit room. Supplied already 7 years old and approx 25cm including pot. Includes 15cm ceramic dish. Because it is restricted in a small pot, your bonsai will need checking morning and evening to see if it needs watering. Keep your bonsai on its tray. This will catch the water draining through the holes in the bottom of the pot and will create some humidity around your bonsai, especially useful if you have central heating on. Don't however let your bonsai sit in water as this can damage its roots. During winter place your bonsai in the brightest place possible, avoiding artificial heat such as radiators. If placing your bonsai on a windowsill, keep it out of direct sunlight. During the summer, your bonsai will enjoy a spell outside, just remember to keep it in a bright, sheltered position. We always recommend feeding your bonsai with a specialist fertiliser - ordinary plant foods can be too strong for the bonsai and may scorch the roots. Feed once a week to once a fortnight during the spring, summer and autumn. Reduce the feeding to approximately once a month in mid-winter when it is barely growing. yellowing of the leaves if the bonsai is deficient in nutrients. Once new shoots have grown to about 2-3cm, using a sharp pair of bonsai scissors carefully cut back to the first pair of new leaves. Your bonsai has individual branches and you should prune to maintain the gaps between them. Prune regularly to maintain the shape of your elm - start as soon as you get your tree. Your elm has been pruned into a triangle shape which is what you should try to maintain. Any new growth which breaks this outline can be removed to prevent the tree looking overgrown.